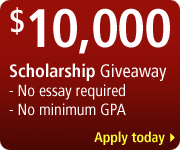 College Scholarships and grants are free money! Always read college scholarship instructions completely. Incomplete or incorrect applications will likely not be accepted. Type or print the application neatly. Your application should be legible. Before applying for college scholarships, put together a quick “resume” of your accomplishments, including extracurricular activities, academic records and employment history. Most college scholarship applications will ask for these pieces of information. Be realistic. Maximize your chances by applying to college scholarships that are the best fit for you and have the least amount of applicants. You probably have a better chance of getting a scholarship from your school for engineering majors, than winning a national essay competition. Don’t wait until the last minute. Completing college scholarship applications takes time and you want to apply to as many as possible! In your excitement to locate FREE scholarship money, don’t fall for college scholarship scams! Scholarship services that promise to “do the work for you” or require a credit card may not be legitimate sources. For tips on avoiding college scholarship scams, visit the U.S. Federal Trade Commission website. To apply for college grants, you must complete the FAFSA every year. You are automatically in the running for federal and state grants based on the financial information that you entered in your FAFSA. The financial aid award letter that you get from your school will tell you if you were awarded any college grants. Check for tuition assistance programs in your state and special college grants available to certain groups such as the disabled, veterans or minorities. If you are a graduate student, check with your school to see if there are any non-need based college grants available for your field of study (usually called fellowships). Examples of federal college grants are Pell Grants and the Federal Supplemental Educational Opportunity Grants (FSEOG) program. To qualify for a Pell Grant, a student must demonstrate financial need. Pell Grant awards are based on the Expected Family Contribution, which is calculated based on information entered into the FAFSA. The maximum Pell Grant for the 2015–16 school year is $5,775.